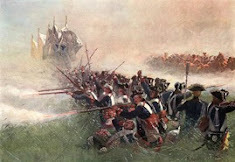 Today saw the fruition of quite a few months of planning for a large French Revolutionary War battle between myself and my friend David Bickley (www.talesfromghq.blogspot.co.uk) using our not inconsiderable collections. David had arranged with Dan of Wargames Illustrated to use the games room on the premises they occupy with Battlefront Miniatures. We set the game up yesterday afternoon after what for me was a tortuous journey down from Durham which took four and a half hours through torrential rain and heavy traffic. Anyway, thanks to my stalwart driver.......er, wife Katherine we made it and set the game up in no time. 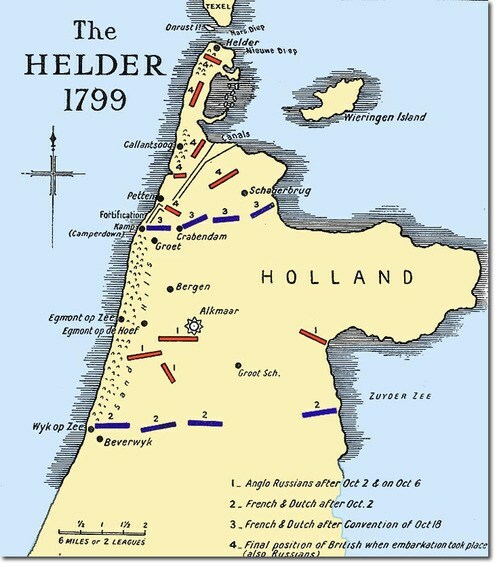 Not everyone will know about this totally obscure and ultimately pointless campaign of 27 August to 19 November 1799 during the War of the Second Coalition, in which an expeditionary force of around 30,000 British and Russian troops invaded the North Holland peninsular in the Batavian Republic. The campaign had two strategic objectives: to neutralise the Batavian fleet and to promote an uprising by followers of the former stadholder William V against the Batavian government. The British sought assistance from Russia’s Czar Paul who agreed, probably/certainly influenced by a fair bit of cash, to send a corps to join the British in this venture. True to form the British didn’t really have a plan, and according to Fortesque, didn’t even know, or couldn’t agree, where to invade, beyond the general objective of ‘The Netherlands'. They eventually chose to land on the windswept low lying North Holland peninsular. It was a good choice as it was close to the Dutch navy’s anchorage. It was a bad choice as the land was flat, criss-crossed with dykes, was inundated with standing water, (and where it wasn't, was extremely sandy with high dunes,) had few roads, and invaders could be easily contained and prevented from moving south towards Amsterdam. The invasion was opposed by a combined Franco-Batavian army of approximately equal strength. Tactically, the Anglo-Russian forces were successful initially, defeating the Batavian defenders in an amphibious landing by the British at Callantsoog and later a joint French/Batavian army at Krabbendam, but subsequent battles went against the Allies, for example Bergen and Alkmaar. Following a defeat at Castricum the Duke of York, the Allied supreme commander, decided upon a 'strategic withdrawal' to the original bridgehead in the extreme north of the peninsular to await evacuation by sea. An agreement (a 'convention') with the French commander, General Guillaume Marie Anne Brune allowed the Allies to leave unhindered. The campaign had partly succeeded in its first objective, in capturing a significant proportion of the Batavian fleet (which to a large extent willingly surrendered). The campaign is interesting for a number of reasons. I've mentioned these in an earlier post but its worthwhile repeating them. When they finally agreed on where to land, the British army successfully conducted an opposed amphibious landing onto the beach at Callantsoog. This was led by General Ralph Abercrombie who was a year or two later to carry out an even more hazardous but impeccably executed landing at Alexandria. Many of the British regiments contained a significant number of drafted-in Militia and Fencibles , were short of officers and were thought by the likes of Moore to be barely trained to a standard suitable to be sent on campaign (indeed he even refused to take one of the battalions of his brigade overseas with him it was in such a poor state).There were exceptions, e.g. the Guards and Major General not yet Sir John Moore’s brigade (2/1st Foot, 25th Foot, 49th Foot, 79th Foot and 92nd Foot) but the quality of the British infantry was certainly not as good as it had been in the American Revolution and would become in theNapoleonic War. The English commanders included such 'notable' figures as the Duke of York, John Moore, Ralph Abercrombie, Eyre Coote and others. There were a fair few numpties like Harry Burrard, Lords Cavan and Chatham and HRH Price William to balance things out. Liaison between the Allies was pretty ineffective, contributing to the failure of the campaign and the ultimate evacuation, and was not helped by the fact that the Russian commander managed to get himself captured along with his second in command. Few if any of the Russians ever saw their homeland again as neither the British or Russians were able or willing to take responsibility for their repatriation, and they spent months, strike with disease and lack of supplies, languishing and forgotten in the Channel Islands as nobody was able or willing to take responsibility for them. Some bright spark in the government had even suggested sending them to Ireland, but as one rebellion had only just been put down it wasn't thought wise to provoke another! This game is representative of the sort of problems that faced the Allies, with the Franco/Batavian army defending dykes and entrenched in villages, poor terrain and few roads. 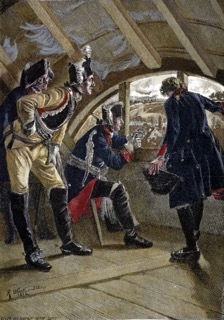 The objective was for the Allies to capture both towns and the interconnecting road in order to force the French and Batavian army to retreat, thus giving the Allies some room to manoeuvre and advance out of the peninsular. There were around 40+ battalions of infantry, 17 units of cavalry and 5 or so batteries of artillery on the table, and a ship offshore. The French were from David's collection and the Allies (with the exception of a squadron of light dragoons and a late reinforcement of English infantry which were David's) were mine. The big town, windmill and sloop were David's and I provided the rest of the terrain. We used Black Powder. On to battle. The armies drawn up for battle. while the Allies formed up in a far from organised way before commencing their attack. H.M.S. Truncheon, a brig of the Royal Navy, provided some much needed off-shore artillery support to the Allied right flank, while transports and larger Men o'War stood further out to sea. 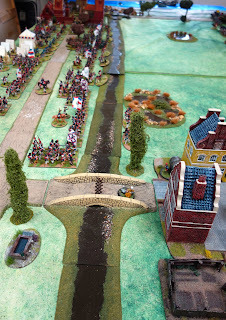 The French left, with a brigade of cavalry preparing to advance over the bridge. The telegraph station is making urgent requests for reinforcements and the battery in the earthwork prepares to take pot shots at the Brig. The British contingent with the Duke of York on his hill to the fore. The French in the centre looked pretty menacing, to me at any rate! The town, lightly held by the French. The French CinC takes time to stop at the bakery for a baguette. The Allies moved first. It didn't start well. One Russian brigade threw a blunder and headed off to the left flank. General Moore's brigade also threw a blunder and raced for three moves across the table to the opposite side of the dyke to the French! Every other brigade in my army, (yes, EVERY!) failed their command roll and remained immobile. Oh bugger I thought! 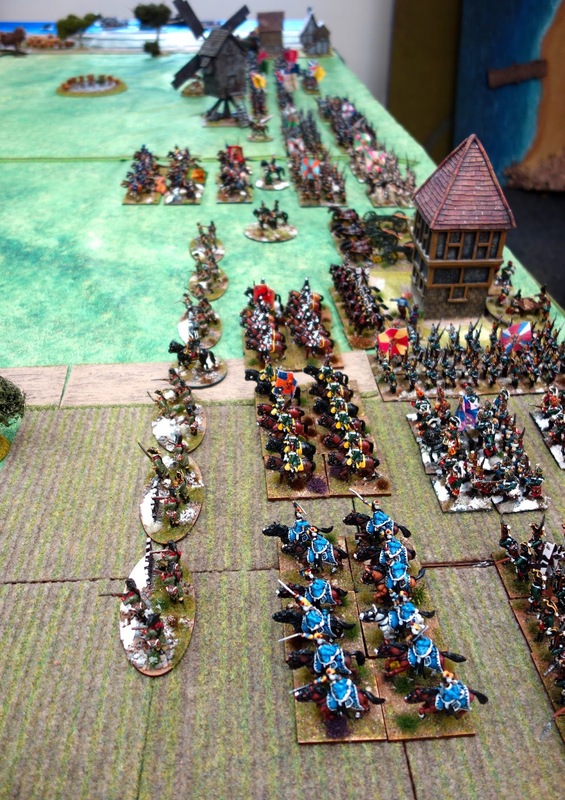 The French countered this unexpected surge of redcoats by threatening their flank with cavalry, forcing three battalions into square where they were to remain for several turns. The other French cavalry on this flank advanced down the beach and charged my light dragoons, breaking them. The French then made the mistake of following up into a fresh unit of English cavalry and were forced to retreat. I didn't follow up as it would have exposed me to the fire of a French horse artillery battery. In the centre the Russians advanced piecemeal towards the French who had crossed the dyke. The Guards move slowly up in support of Moore's brigade. Supported by two british light guns they were able to drive off the French cavalry, enabling their comrades to form back into line. The Russian jager battalion steadfastly refused to advance and then blundered to the rear! The French occupied the town with their cavalry and moved two regiments across to my side of the dyke. 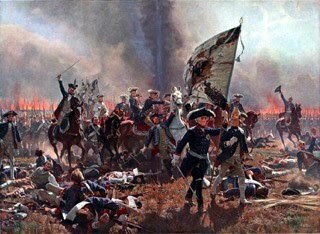 The Russian cavalry charged, driving off both enemy units, one of which had been caught in column. The Russians in the centre were disintegrating, and although the French advance was stalled one Russian brigade lost two battalions broken and two more shaken and was forced to withdraw shattered. A large hole appeared in the Allied centre. The British (in particular the Scots) were grimly hanging on as I managed some pretty well-timed saving rolls which prevented them from destruction. The navy was effective in bombarding the French left. Causing the French hussars pictured above to break off and retire. The French cavalry brigade was shaken and had to retreat, along with its integral horse artillery. The British cavalry advanced and in the following turn charged the French, driving off the hussars and destroying the artillery which were caught limbered behind the hussars. Back on the Allied left the Russians have finally got moving and have driven the remaining French cavalry off, occupied the town and crossed the dyke. HM 92nd were forced to retreat shaken, but were rallied the following turn. HM 79th were hanging grimly on but were also forced to pull back, but a rout was avoided by some nifty saving throws on my part. The next turn French dragoons burst over the dyke and hit the 92nd in the front. 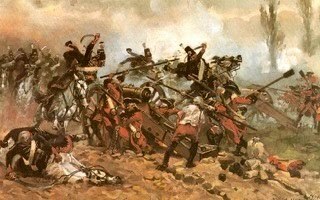 (I have introduced a rule that British infantry charged to their front where their flanks are not threatened by the chargers do not HAVE to try and form square and can take a chance they will drive the enemy off. What worked 40 years earlier when cavalry charged the front of formed infantry should still apply imho). The French dragoons survived the closing fire but were destroyed in the close quarter fighting that followed. The remains of Moore's brigade was unable to exploit the destruction of the French cavalry and the garrison of the town as the most of brigade had by now become shaken and it was forced to retire. The Guards however were moving up to their rear and would soon be in a position to take the town unopposed. The French in the centre were reinforced but hoped for reinforcements did not arrive while more English (albeit 2nd rate ones) had arrived and more were due, landing on the beach. 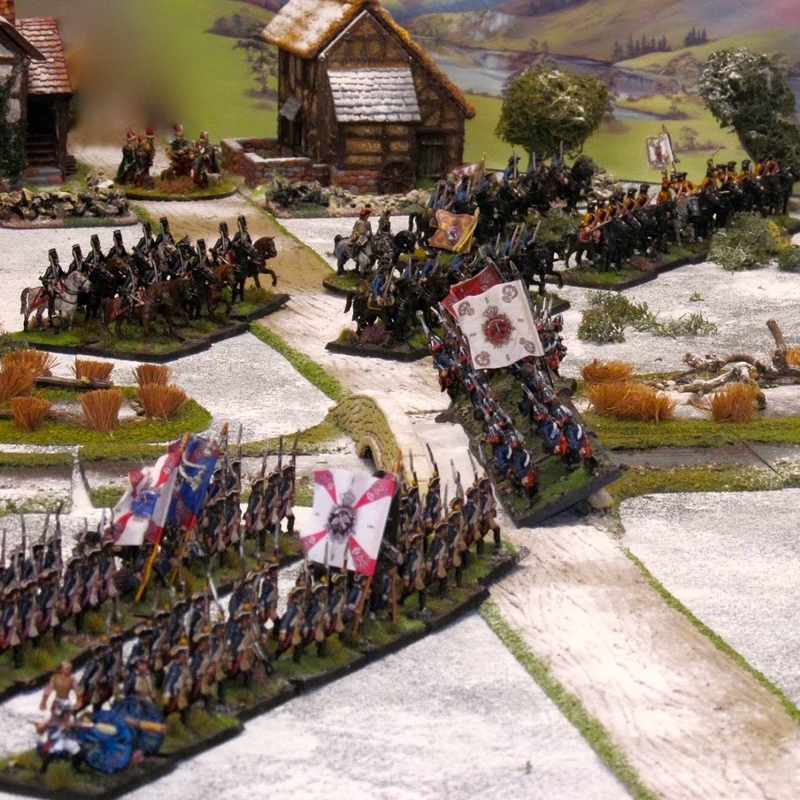 The Russian hussar regiment did not move a single millimetre the entire battle as they failed every command roll! Such a pretty unit too. The French were by now hemmed in. Both flanks were broken and both towns occupied by the Allies, thus controlling the road. With reinforcements a long way off and the centre crumbling the French commander ordered a withdrawal. The French very very nearly broke through in the centre but just ran out of steam and luck. Russian artillery, one of only two batteries on the Allied side (plus the contribution from the RN). Despite a serious pep talk from me they were quite ineffective throughout the entire battle. At last the jagers advanced (now that the enemy had fled) and covered the Russian columns and cavalry as they formed up on the French right flank. 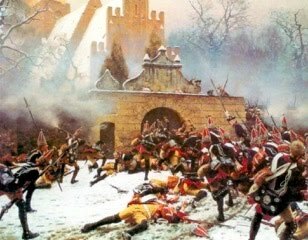 The French withdrew, abandoning their camp to the attentions of the rampaging Cossacks, who had been conspicuous by their lack of action during the battle. Duncan MacFarlene entered into the spirit of the game with his bespoke T-shirt. So, it was a cracking game, and a hard won Allied victory. I managed SIX blunders in seven turns while the French threw two, so I am surprised at the result. I was very lucky with my saving rolls which compensated for a dismal showing when it came to getting my troops moving, as I was with winning the 'dice offs' in turns 5 and 6 which determined who was reinforced. 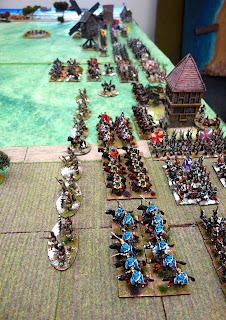 As I mentioned earlier, this was a large game with 60 units or thereabouts in roughly 19 brigades on the table, but we rattled through with only a short lunch break and some pauses for photographs to get a result in a little under five hours of actual play. Much thanks must go to Dan of WI for arranging for us to use the facilities and for looking after and feeding us so well during the course of the day and a half we were there, and to Jamie who made us several cups of coffee and took dozens of photos which will appear in a forthcoming issue of the magazine. Special thanks to Duncan for also looking after us and keeping us right with the rules. Everyone was especially helpful in lugging numerous heavy boxes of figures up and down the stairs as well. We both thoroughly enjoyed our time as guests of Wargames Illustrated. The game was relaxed yet very challenging, and received a great deal of attention and positive remarks from everyone there. Our evening in the hotel was also really nice as we put the world to right and talked about our obsession with the most wonderful hobby. We've been invited back next year for another game as well. Seven Years War next time. Colin, that is a smashing looking game! Oh it was grand,wasn't it! Splendid account there and wonderful pictures! See you at Claymore! Awesome! Spectacular pictures, what a great looking game Colin...the Navy is really fantastic! magnificent game, I love your comment " our obsession with the most wonderful hobby" so very true. Good result all round I would say Colin. What a lovely looking game, full of action and of a very obscure conflict. Well done to all involved! Most splendid indeed, a fine write up and photo's. Bravo! gentlemen.